If you know anything about the world of nutrition, you have probably heard of the ketogenic, or keto, diet. There are tons of different websites and sources out there saying different things about what this diet entails, who should follow it, and what health benefits you can take away from it. It is a lot of information to sort through! Luckily we have compiled a list of 16 frequently asked questions regarding the keto diet. Whether you want to know what you can eat on the keto diet, how much it costs, or just if it is right for you, check out the list below. We have answered all of your most burning questions! The keto diet helps get the body into a state of nutritional ketosis. This means that your body will burn its fat stores instead of sugars. When your body is in this state, you do not depend on insulin or glucose to regulate your energy levels. That means no more highs and crashes as a result of rising and falling blood sugar levels. Getting your body keto-adapted is achieved by decreasing the amount of carbs you eat while consuming a balanced amount of fats and proteins. This diet is very low in carbohydrates and high in fats. Contrary to popular belief, it is not a high protein diet. 2. 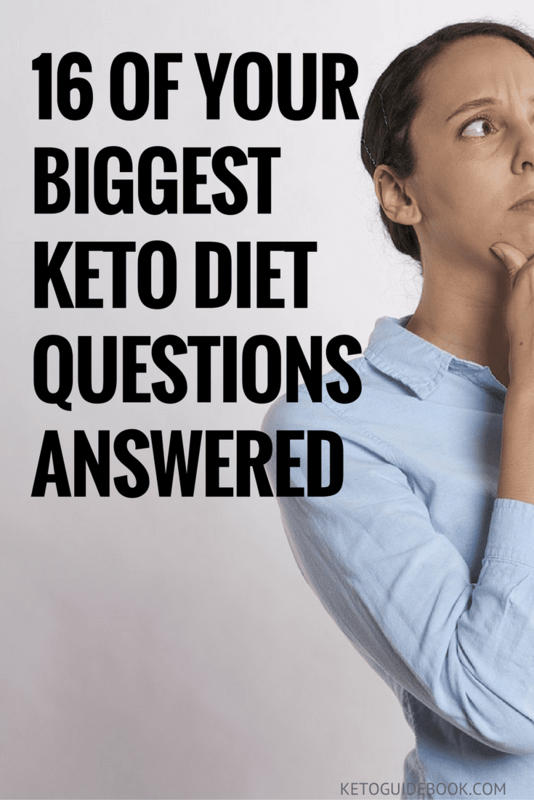 What Can I Eat On The Keto Diet? Everyone’s version of the keto diet will be slightly different because of your personal food sensitivities. Generally, the diet includes meat, fish, eggs, oils, nuts, non-starchy vegetables, and the occasional low-carb fruit. Cheeses and seeds are also acceptable. Those with a dairy allergy should avoid milk products and get their calcium from leafy greens instead. 3. Can I Drink Alcohol On This Diet? As a general rule, alcohol is discouraged when following the keto diet. The reason is because when the body is processing alcohol, it stops burning fat, which is the whole point of the diet. However, your body will immediately go back to ketosis after the alcohol is metabolized, so a small amount of alcohol now and then is ok. Remember, though, that choosing the right alcohol is key. Beer is full of carbs (it is basically like drinking a loaf of bread), so it is not allowed. Sugary cocktails that contain juice or soft drinks are also discouraged. The best bet if you want to drink alcohol while on the keto diet is pure spirits like vodka or whiskey (zero carbohydrates) or wine (low carbohydrates). Read more on what to drink on the keto diet. 4. What If I Feel Dizzy/Tired/Weak? Is That Natural? Because your body is used to burning carbohydrates, you may feel weak or dizzy when you first start following the keto diet. Your body is getting rid of extra water and salt at a faster rate than usual, which can cause a dizzy feeling. Drinking lots of water, eating foods high in potassium, and drinking bone broth can all help relieve these symptoms. Once you fully reach nutritional ketosis, which takes up to 10 days, this feeling will go away. Until then, be sure to stay hydrated and rest when you feel tired. This will ensure your body recovers and feels its best. 5. What Are The Health Benefits Of The Keto Diet? Weight loss is the major benefit of following this diet. Cutting carbs from your diet actually helps reduce sugar cravings. You will instead feel satisfied by healthy fats and proteins, which slashes your daily calorie consumption. This diet also helps stabilizes blood sugar levels, reduces the body’s fat percentage, and helps lower blood pressure. Eating keto can also help reduce inflammation in the body, which in turn decreases chronic pain, joint problems, and autoimmune diseases and will make you generally feel better! 6. Is The Keto Diet Expensive? Not at all! While the foods you buy on the keto diet may be more expensive, you will actually save money by not purchasing convenience and snack foods. Your grocery bill will have a better value for your money thanks to the higher quality ingredients of the items you buy. If you are a heavy drinker, you will also save money while on this diet because alcohol is only allowed in extreme moderation. 7. How Do I Get Started With The Keto Diet? First thing’s first: consult with your doctor. Every diet is not for every person, so chat with your primary care practitioner about how best to follow the keto diet. He or she will help you decide the best way to approach this eating plan considering your medical history and food sensitivities. Next, consult websites like this one on how to follow this diet. Find keto recipes that sound appetizing to you and make your first trip to the grocery store for all your keto ingredients. It’s that simple! 8. What Should I Avoid When On The Keto Diet? Any sugars and sweeteners, both natural and artificial, should be avoided. Grains and starches like bread, pasta, rice, potatoes, and anything made of flour and/or sugar are generally not allowed. Most fruit is also not part of the diet except berries in moderation and avocados. Because the keto diet focuses on feeding your body with real, whole ingredients, processed foods should be avoided. Refined sugars especially should be cut out right away. Fill your cart with fresh, low-carb veggies, real cuts of meat, and natural sources of fats and oils and you are on your way to a healthier you! 9. What Medical Conditions Can This Diet Help With? Apart from people who want to be healthier in general, there are many health conditions that can be improved by following the keto diet. Because it balances blood sugar levels, this diet is great for people with both type 1 and type 2 diabetes. Because weight loss is common on the keto diet, your risk for obesity, stroke, high blood pressure, and heart diseases decrease greatly. Those with autoimmune diseases, cancer, and joint problems will benefit from this diet’s anti-inflammatory properties. Other medical problems including epilepsy, Parkinson’s and Alzheimer’s, PCOS, fertility issues, and GERD can all improve with this diet! 10. How Can I Travel/Eat Out/Go To Parties On This Diet? Just like following any special eating plan, following the keto diet outside of your own home can be challenging. But it is definitely not impossible! The most important step to take is to know your diet inside and out: what you can eat and cannot eat and appropriate portions for your body. 11. Isn’t Cutting Out Carbohydrates Bad For You? In the case of the keto diet, no. Because you can eat non-starchy vegetables, which do contain some carbohydrates, you will not be completely cutting this nutrition group from your diet. You just eliminate the worst kinds of carbs so that your body is only nourished from the healthiest source of carbs. Grains, refined sugars, and sweets only do harm to your body anyway. 12. Won’t I Lose Muscle And Feel Low-Energy Without Carbs? It’s true that carbohydrates provide the body with energy, but they are not the only nutrient that do so. Your body can also burn fat to make energy and in fact, they run better that way than when they are burning sugars. No need to worry about losing muscle mass, either! Because you still consume a good amount of protein when following the keto diet, your muscles will be fine. 13. Isn’t’ High Fat Intake Bad For You? The keto diet will not cause high cholesterol levels. In fact, eating a low-carb diet is more likely to lower your HDL (bad cholesterol) levels even more than a low-fat diet does! You will lose more pounds of weight and have a lower risk of heart disease to boot. 14. What If My Family And Friends Don’t Support My Diet? Whenever you take on a new major lifestyle change, people are inclined to doubt you. This is especially true if they don’t understand the keto diet. Try to explain to them exactly what the diet entails and all of the amazing health benefits you will reap from it. If your family and friends still doubt you, just go with the flow. Do not try to “preach” to them because it may cause them to act even more negatively toward you. Let your health progress speak for itself! When you start to lose weight and feel and look better, your loved ones are sure to change their tune! 15. Is The Keto Diet The Same As Other Fad Diets? Not even close. Unlike most fad diets, the keto diet is not designed as a quick fix for weight loss. It is a very involved total lifestyle change that will reset your body for good. It is also backed up by scientific evidence whereas fad diets are not. They can even be harmful to the body, while this diet helps make you healthier all around! The keto diet is also not the same as the Atkins diet, despite what skeptics may try to tell you. Firstly, the Atkins diet focuses on eating mostly protein while the keto diet feeds your body with good fats. More importantly, though, you are technically allowed to continue eating processed foods while on the Atkins diet. Following the keto diet, though, emphasizes eating real, whole foods instead to ensure your body is fueled with the best possible ingredients. 16. Do I Need To Count Calories On This Diet? Counting calories is not a part of the keto diet. The reason why? After cutting addictive sugars from your diet, you will feel fewer junk food cravings. Not snacking all day will naturally lower the number of calories you consume. Your body will be so satisfied by the good fats and protein you are eating, you will not even crave those high-calorie foods that are devoid of nutrients. The keto diet is about listening to your body. Eat when you are hungry, eat slowly, and stop eating when you are full. There is no reason to eat 3 or more times per day if your body does not need it. Not consuming excess food just because you are “supposed to” helps cut down your daily calorie count, too. If you want to count calories when starting the keto diet to teach yourself portion control, you may, but it is not necessary. As you can see, there is a lot that goes into following the keto diet and lifestyle. But do not get discouraged! Your body will thank you for cutting out those sweets and treats. Even if you feel mentally and financially drained by this diet at first, remember that the cost is actually small. If you don’t follow the keto diet, you may have to pay thousands of dollars in medical bills and prescription drugs instead! Find your new favorite recipes, make your keto-approved grocery list, and head out to the store. You will soon feel and look amazing with high energy levels, less pain, and fewer worries about terrible medical conditions. Get ready to reset your body to how it is supposed to run with the keto diet! Seriously, I cannot believe, other than for fear of being sued, that you would say to consult your physcian/Dr. first…No Dr. is going to tell you this OK..they are not wired/trained this way…How on earth could this harm any one, diabetic, hypoglycemic, even celiacs? Seriously…so silly! This way of eating is a win-win for everyone! My doc gave me the clear to go on the Keto diet. They do their research. I’m only on day 2 but I’ve heard of great results by many people I know. Please change your comment about HDL to LDL. HDL is actually the “good cholesterol”, LDL is the “bad cholesterol”. My numbers were excellent after following a ketogenic way of eating ( WOE). This WOE also greatly decreased my hunger and urge to binge.